2 Burnt To Death, 8 Others Injured As Gas Explodes In Lagos – Royal Times of Nigeria. Two people have been burnt to death and eight others sustained serious burns as gas exploded in a gas plant Magodo area of Lagos, Southwest Nigeria earlier today. Officials of the Lagos State Emergency Management Agency, LASEMA and fire servicemen were on ground to quel the fire. 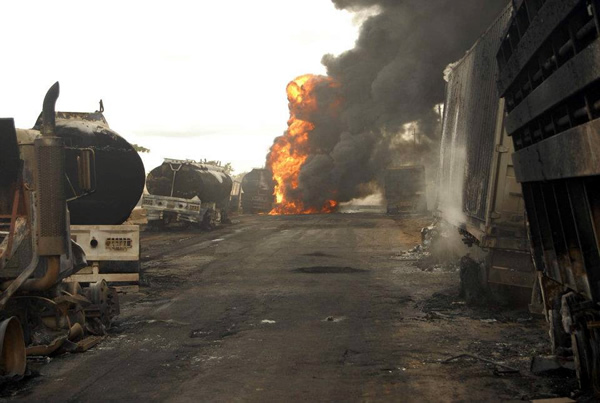 General Manager, LASEMA, Adesina Tiamiyu said the agency was notofied about the explosion at the gas station, saying that on arrival at the scene, it was discovered that the gas plant was engulfed by the inferno. Tiamiyu said the situation wascompletely under control with perimeter of the vicinity secured and evacuation of people away from the scene, adding that the officials of IKEDC had also completely isolated power supply from the affected area to avoid any other incident.